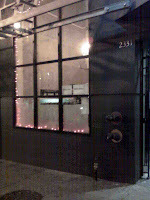 After retroactive posting to Mission on Mission, I continue backtracking from Bissap Baobab to Specchio Ristorante Enoteca located between 19th and 20th Streets on Mission Street. When I left Bruno's, I expected my next destination to be Cha Cha Cha but as I strolled down the street I passed a large, plate glass window trimmed with white Christmas tree lights that framed a series of interior shelves stacked with rows of wine bottles. I was forced to stop and explore this new Mission Street addition, Specchio Ristorante. In my many trips down Mission Street I had never noticed this spot. Upon entering I ran into a hostess stand and then took a hard left turn to a long countertop followed by a number of tall table tops. As I navigated the space, I wasn’t convinced that Specchio qualified for Mission on Mission – once again, I was in the “is it a bar? Or, is it a restaurant?” gray area that required further exploration. As I made my way passed the bar, I was surprised to see that the space opened up to a roomy dining area with lofted ceilings and plenty of metal tables and chairs. The restaurant had a minimalist feel with clean and crisp lines, white walls and glossy floors. Penetrating the sterile ambiance, a black and white movie beamed over the kitchen in a manner already made famous by other Mission establishments like Foreign Cinema and Dalva. Figuring that Specchio satisfied the necessary parameters for Mission on Mission— namely shelves of alcohol guarded by a long, hard drinking surface—I ordered a Stella Artois only to learn that the tap had run dry. Thankfully, Sierra Nevada was available which I decided to pair with bruschetta, crab cakes and parmesan cheese drizzled with a balsamic reduction. The food was good but the service was spotty. As is often the case with new establishments, the wait staff was eager and enthusiastic to get me seated but they couldn’t quite get the timing right after taking my order. The busboys were diligent keeping my table clean and my water glass full, but I had to wait endlessly for a fresh beer. Upon receiving my second Sierra Nevada, it finally dawned on me what was “off” with Specchio Ristorante…there were no seats at or around the bar. Sure, there were seats for diners in the back, but there was nothing to sit on in the beautifully designed bar area. Forced to dig their elbows into the hard surface of the bar in an effort to alleviate the pain of standing upright, the stylish SOMA after work crowd sipped their pinot noirs through grimaced smiles under the bright lights and against right angles. Witnessing these uncomfortable stances, I couldn’t help but feel extra sympathy for the stilettoed women who were suffering mercilessly on the polished concrete floor. Needless to say, the surroundings made me—and everyone else—uncomfortable. 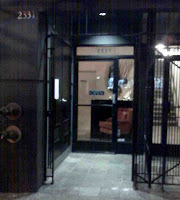 So far I have not encountered a single wine bar on Mission St. and Specchio would do well to embrace its uniqueness by creating a comfortable atmosphere for those seeking a nice glass of vino, a relaxing ambiance and a nice meal. 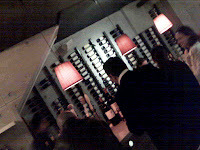 Some candles, a few stools and a couple couches would go a long way to attract the wine crowd. If not for the Christmas tree lights, I would have walked right by Specchio—which serves as a good reminder for me to keep my eyes open as I head off to the next location. The Mission is a street that is in constant flux – a street where old and new is constantly switching places.